When a wealthy patriarch dies leaving behind a huge inheritance, frequently succession conflicts break out. While each conflict may have its specific dynamics, they all usually have a common denominator: selfishness. Everyone related with the deceased wants a share of the pie, with the progeny often wanting the biggest piece, if not the whole pie. The Ramayana depicts a succession conflict between two princes after the death of their father. Strikingly however, this conflict is caused not by selfishness, but by selflessness. Rather than two brothers arguing to get the inheritance for themselves, they argue that the other should accept it. And no, the inheritance is not a white elephant – it is the flourishing kingdom of Ayodhya, one of the most powerful kingdoms in ancient India. As intriguing as the conflict is, just as endearing is its resolution. This narrative begins in the prosperous kingdom, with its climactic conflict occurring in the forest of Citrakuta and the denouement on the outskirts of the capital. The ageing monarch Dasaratha prepares for his eventual retirement by deciding to appoint his oldest son Rama as the prince regent. His youngest wife Kaikeyi, being misled by her maid, sees this succession as an attempt to sideline her and her son Bharata. So using two boons that the king had promised her long ago, she compels him to send Rama on exile for fourteen years and have Bharata declared the prince regent. While the kingdom sinks into an ocean of horror and agony, Rama graciously departs for the forest with his wife Sita and younger brother Laksmana. Within days the heartbroken king breathes his last. Bharata, who was in a relative’s kingdom while this tragedy unfolded, is summoned to perform the last rites of his father and to take over the reins of the kingdom. When Bharata returns, he is struck by a series of shocks – first that his father is dead, second that his brother is in exile, third that his mother is the cause of both these horrors, fourth that his mother has misunderstood him so much that she thinks he will be pleased by her machinations, and fifth that many people, both courtiers and citizens, suspect him to be a coconspirator with his mother. Steeling himself, he performs for his deceased father the elaborate funeral rites befitting a monarch, while resolving throughout to somehow set right at least some of the grievous wrongs. He decides to go personally to the forest for beseeching Rama to return and accept the throne. When Bharata expresses his noble resolve to the courtiers, their lingering suspicions about his complicity are dissipated. His selflessness enlivens them, as does the possibility of their beloved Rama’s return. They desire eagerly to accompany Bharata to the forest. He consents gladly, knowing that their presence will reinforce his request. The royal priest Vasistha goes too, as does the chief minister Sumantra and the three recently widowed royal mothers: Kaushalya, Sumtira and Kaikeyi. Understandably, Bharata has reservations about letting Kaikeyi accompany him. But she has had a change of heart, primarily because Bharata had reproached her and rejected her scheming. Seeing that she was sincerely repentant, he allows her to come, hoping that since she had asked for Rama’s exile, maybe her request would influence him to end it too. When the citizens hear of Bharata’s righteous resolve, they too are delighted, and many of them desire to go with him. Hoping that the gigantic show of strength will persuade Rama to return, Bharata orders that a road be constructed to take the huge procession into the forest. Once the road is constructed, Bharata strives to retrace Rama’s path, seeking the help the tribal king Guha and the sage Bharadwaja. Both of them initially express apprehension about Bharata’s going to search for Rama with such a huge contingent. Their barely concealed suspicion about his intentions towards Rama shreds Bharata’s heart. Controlling his pain, he expresses his fealty to his older brother with disarming sincerity, not only removing their suspicion but also winning their heart. They gladly show the way that Rama has taken. Normally, we feel angry when we are accused even when we are guilty, what then to speak of when we are not. Bharata was repeatedly subjected to false accusations – and he had the royal power to silence his accusers. But far from angrily resorting to such power, he humbly wins his accusers over with his heart’s power. By the sincere outpouring of his anguished heart, he fervently expresses his utter ignorance of, even revulsion with, the conspiracy against his father and disarms those who had doubted him. After a long journey through the dense forest and up the scenic mountain at Citrakuta, Bharata breaks into a clearing with a simple cottage. Seated outside the cottage are Rama, Sita and Laksmana. Bharata is anguished to see them all dressed in tree-bark instead of the familiar royal robes. Falling at the feet of his brother, he grieves over the fate that has reduced them to such destitution. After initial greetings, Rama enquires about their father’s well-being, giving voice to the grave doubt that had been troubling him since he had seen the royal elephant satruïjaya riding in the procession without any ruler atop it. Bharata, with a heavy heart, breaks the news of their father’s demise. 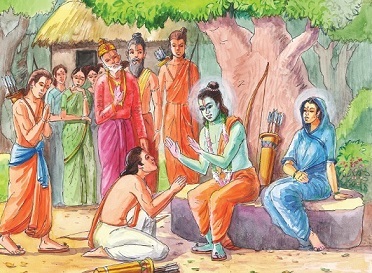 Rama is grief-struck. Somehow he stoically pulls himself together and goes to the nearby river for offering the oblation of water to his deceased father. His shock and grief subside slowly, and his responsible royal mind turns to the problem of the empty throne, and the concomitant threat of invasions from without and disruptions from within. Seizing the moment as opportune, Bharata fervently implores his brother to return and assume kingship. Rama gently refuses, saying that now the only service he could render their deceased father was to honor his memory by fulfilling his word. Bharata had already anticipated that Rama would not agree so easily, so he offers to himself stay in the forest in Rama’s place – thus, one son of Dasaratha would live in the forest, and his word would be honored. Seeing Bharata’s astonishingly selfless offer, Rama smiles, but replies that each person has to bear one’s own karma and no one can take anyone else’s place. Indeed, if people arbitrarily experimented with karmic surrogacy, they may well throw the universal order into chaos. Their loving yet intense discussion goes on for hours, with both brothers quoting scriptural and traditional precedents in their attempts at persuasion. The citizens are amazed and proud to see the brothers’ erudition, which impresses and pleases even the assembled brahmins and sages. Despite their prolonged discussion, both remain unrelenting: Bharata in his request and Rama in his renunciation. Seeing Bharata unable to make any headway, the elders try to persuade Rama. Vasistha, the queens, Sumantra and the accompanying brahmanas all give various reasons why Rama should return. Rama responds to their arguments with respect, but without swerving from his position. At this point, Bharata could have been justified in giving up. He could well have said that he hadn’t caused Rama’s exile and had done his best to get him back: “If Rama isn’t ready to listen, what can I do but accept the kingdom?” Most people would have accepted a kingdom that had been providentially dropped into their laps. But Bharata was not most people. Seeing his hopes of Rama’s return dissipating, he makes a last-ditch plea. He sits on the forest floor declaring that he would sit there fasting till Rama accepted the kingdom. Everyone watches transfixed, waiting for Rama’s response. After a momentous pause, Rama picks up Bharata, pulls him into an embrace and tells him that his love has won. As Bharata’s face blossoms in joy, Rama adds with a sweet smile that he accepts the kingdom, but since he wants to honor his father’s word, he was now entrusting the kingdom to Bharata for the fourteen-year exile period. Thus, Rama sagaciously resolves the dilemma, honoring both Bharata’s love and his own duty. Bharata is disappointed, but he knows that there’s nothing more he can do to persuade Rama. Still, his selflessness finds another endearing expression. proximity with a famous person than their actual connection. Or a caretaker-ruler may commandeer all the trappings of royalty to appear like the actual ruler. In contrast, Bharata wants everyone to know his position: caretaker, not ruler. So, he requests Rama to give his sandals, which he will place on the throne. Bharata intends to sit on a humble seat below the throne, thus ensuring that the court’s positions reflected his heart’s disposition: Rama is the actual ruler and Bharata his servitor. After Rama obliges by offering his sandals, Bharata places them on his head. He beseeches Rama to return as soon as the exile period ends and declares that he wouldn’t be able to maintain his life for even one day beyond that – fourteen years of separation from Rama would be painful enough. Rama reassures that he will return, and Bharata takes tearful leave. On returning to Ayodhya, Bharata enthrones Rama’s sandals. Sandals on a throne – such a symbol of selflessness will probably have few, if any, parallels in world history. What brother would ask for his brother’s sandals? And if a brother offered them anyway, the other brother would probably place them on the head – not his own head, but on his brother’s head to hit a blow of affronted honor. For the next fourteen years, Bharata shoulders all the responsibilities of the king, but refuses all the privileges – quite the opposite of many present leaders who enjoy privileges without executing responsibilities. Bharata lives in a hut outside the city at a place called Nandigrama. Indeed, Bharata adopts a diet and dress similar to what Rama has adopted, thus performing in the kingdom the austerities Rama is performing in the forest. Bharata’s selflessness is also evident at the end of the exile, in his eagerness to welcome Rama back. Rama knows that time has a dangerous power to erode even the noblest of resolves. So he wants to check if over the fourteen years Bharata’s feelings have changed, if he has become attached to the kingdom. If Bharata desires to stay on as its sovereign, Rama decides that he will not reclaim it. Accordingly, he sends Hanuman as a messenger and observer. The astute monkey is to deliver to Bharata the message that Rama will return soon, and observe whether Bharata evinces any displeasure at this news. Ever eager to serve, Hanuman flies ahead, lands at Nandigrama and conveys Rama’s message. The news fills Bharata with unrestrained jubilation. His face is a study in delight. He embraces and thanks Hanuman for bringing such great news, and offers him profuse thanks and abundant gifts. Bharata’s facial and verbal expressions of joy leave Hanuman in no doubt about the unreserved affection that the prince has for Rama. Bharata rushes to arrange a majestic welcome for Rama. Soon, a huge congregation of courtiers and citizens assembles at the outskirts of Ayodhya, eagerly awaiting Rama’s return. When they see Rama with Sita and Laksmana and a large number of monkey warriors high in the sky aboard the celestial airplane Puspaka, they gasp in astonishment and delight. As the plane descends, Bharata starts offering articles of worship to the airborne Rama. After Rama disembarks, Bharata rushes forward and falls at the feet of his brother. Rama lovingly lifts and embraces him, their hearts joined together not just by proximity but also by the intensity that comes from the love that has withstood the toughest of tests. Valuing relations over possessions is foundational for the sustenance of family, society and humanity at large. Bharata considered the affection that he relished in his relationship with Rama far more meaningful and fulfilling than the gratification of ruling the kingdom. Even if we can’t be as selfless as him, still a slight increase in selflessness in our relationships can significantly improve them and substantially decrease conflicts. And the Ramayana’s lessons run deeper than teaching us how to improve our relationships. Rama is not just a venerable elder brother – he is God himself descending to play the role of an ideal human being. Emotions directed towards him have the capacity to purify and elevate us, eventually granting the supreme liberation. The more we imbue our practice of bhakti-yoga with selflessness, the more our devotion becomes stronger, deeper and sweeter, propelling us on the path to eternal spiritual fulfillment. The evolution of selflessness thus progresses from valuing people over things to ultimately cherishing God over everything. A materialistic vision makes selflessness seem like selfdeprivation. If matter and material things are the only source of enjoyment, then being selfless means depriving oneself of those things. Consequently, being selfless often equates living with less. Though materialistic people may tout the word “love” frequently, what actually goes on in the name of love is often an arrangement for mutual material gratification – when the gratification stops, the love too disappears. In contrast, a spiritual worldview helps us understand that our relationships are meant not for our material gratification, but for our spiritual evolution. That is, our relationships are meant to give us the realizations necessary for us to expand the scope of our love till it reaches the supreme spiritual reality God. And loving him is not an isolated activity; he is, after all, the Lord of everyone, including our loved ones. So, the more we learn to love him, the more our love for our loved ones also becomes spiritualized and selfless – based not on the gratification they provide us, but on their connection with the One whom we aspire to love. Moreover, the Lord is the source of all happiness, as the very name Rama indicates. We can access this happiness by cultivating his loving remembrance. The greater our love, the more relishable becomes his remembrance. So, we start seeing love itself as life’s supreme treasure – it is the greatest source of fulfillment, a fulfillment that becomes increasingly accessible through selflessness. Thus, we understand that selflessness is not impoverishing, but enriching. Not necessarily. Initially we may strive to love the Lord with the hope of happiness. But even such less-than-selfless connection with the Lord purifies us, thus raising our love to a higher level. And for the purest love, happiness is not the motive, but its natural result – happiness is not the product, but the byproduct. We don’t love the Lord to be happy – we love him simply because he is so lovable. And by loving him purely, selflessly, wholeheartedly, we naturally relish the highest happiness. Pertinently, the srimad-Bhagavatam (1.2.6) states two significant characteristics of pure love for God as unmotivated and uninterrupted, conveying its selflessness; and as granting fulfillment to the heart, conveying its joyfulness. Thus, this sublime love is simultaneously selfless and joyful.